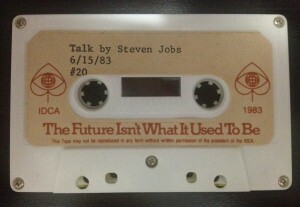 So finally, here is my digitized recording of a “Talk by Steven Jobs” from the 1983 IDCA. The previously unavailable Q&A session starts at about 21:30 of the recording. Note that most of the questions asked by the audience are unintelligible, but can generally be divined by the responses Steve Jobs gives. I digitized the recording using Audacity and applied a simple noise filter to remove the tape hiss and saved it as MPEG-4 (M4A). And finally special thanks to SoundCloud.com for agreeing to host the download. Enjoy!